THE DISTORTION THEORY: SPAIN’S "PHOENIX LIGHTS"
Some important UFO incidents occurred in Spain in 1997. 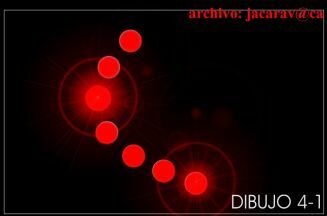 Dozens of people confirmed the flight of several formations of unidentified lights in the sky near the Strait of Gibraltar. 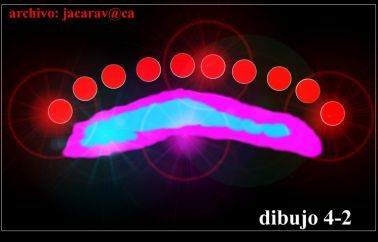 The evolution of these UFOs were reported from the cities of Algeciras, Tarifa (Cadiz) and Gibraltar (British Colony). 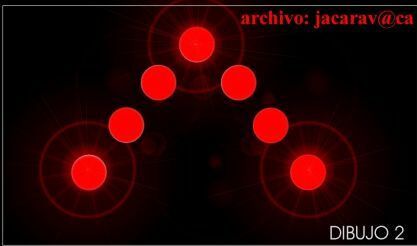 telephone company, who saw, on the night of February 19, 1997, several UFOs above his home, located in a residential area of San García (Algeciras). According to Mr. Conde, about 23:20, he saw in the clear night (no clouds), the flight of seven or eight strange lights, in perfect angular formation, flying slowly overhead. after about 6 minutes, towards the Mediterranean. Mr. Conde tells us that at no time did he hear any noise from the mysterious formation. After personal contact with Mr. Conde about the event, talking with him for over an hour, we thought maybe he had seen a formation flight of several military aircraft on night maneuvers. Therefore, we decided to check for the possibility of air traffic for that night. On the other hand, without prematurely closing the case, we opened another line of research by trying to verify if more people were able to observe the strange formation of lights. We published a press release in the newspaper, Southern Europe (Algeciras), appealing to all readers who have witnessed any unusual aerial phenomenon on the night of February 19 to call us. Soon we had more witnesses. Joseph and Gloria of Tarifa, were watching television when they heard a noise like a large transport plane that seemed to fly over the city. The noise, in the words of the witnesses, was "continuous and more severe than the normal sound of the planes, and they seemed not to be moving away." Fifteen minutes later, the noise returned but this time, moved by curiosity, Joseph looked out the window, and observed, for a few seconds, a V formation of seven red lights moving towards Algeciras. 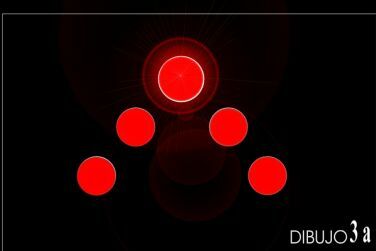 Believing that it was a bomber, he returned to the living room of his home, but after fifteen minutes or so, the strange sound repeated, and this time, with his wife, he made a closer inspection of the enigmatic formation of red lights in V, identical to the one he had observed moments before. He told us: "It was big and very slow... the red light did not blink...I was a bit surprised, because I'd never seen that kind of aircraft fly over here not at night...I certainly have not seen such planes, and they flew very low...". We asked about the supposed shape of the aircraft, and he replied, "The truth is I do not remember if there was a fuselage." This information created several questions: For the first time, witnesses indicated they heard a noise from the lights. This left us perplexed. No other witness of the almost fifty we would come to meet during the investigation heard any noise. Another fact to consider in the above incident is that no white light was observed. The case is complicated. And last but not least, the couple had been able to see objects and the lights twice. Although this detail was new to us, soon we found more evidence that would support the existence of several formations of unidentified lights in the skies that night in Cadiz. "Michael," a witness who belongs to a "security corps" also reported the presence of UFOs in the sky that night over the Strait of Gibraltar. His testimony is of vital importance to the case because he is a highly qualified person, accustomed to the night security of the Strait, and was skilled at identifying all types of aircraft and boats. Using night vision binoculars, he saw, in the starry sky, something unusual: several lights in perfect V formation that came from the Atlantic to the Mediterranean. 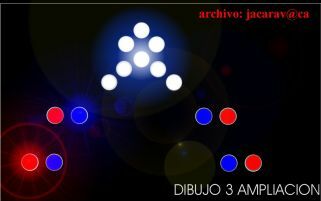 It was about five lights, four of which were red and the fifth, which was larger and white, at the vertex. ”Michael" took out his binoculars (40x70) to get a closer look at the mysterious lights. The observation lasted about 15 seconds, and the lights went from east to west; I did not hear any noise." "Michael," in his profession, has had the opportunity to see a variety of aircraft in flight (day-night), both military and civilian, at the airport of Gibraltar, so that his testimony is important. When asked if it could be some type of aircraft, he said, "I know of no aircraft using that kind of lighting; it is not normal." "Michael’s" testimony was key to the case. He was the only witness who had the training to contribute data to indicate a UFO hypothesis. Enrique Q. and Andrés C. P. y Cristóbal,decided to go fishing in the area of Faro, beyond Getares beach where the first witness (above) Antonio Conde resides. The row of lights disappeared in the distance, flying slow and steady. Neither witness gave too much importance to the issue and continued fishing. About 45 minutes later, Enrique gave an alarm. An unusual formation of red lights accompanied by a row of lights that changed color from blue to purple had appeared in the sky. "They traveled the same way as the first group of lights, Enrique said, but the row of purple and blue lights gave him a whole aspect of being a "single object." Like the other two formations that came from the Getares area and disappeared in the distance, the three formations used virtually the same "air corridor." Obviously those formations and groupings of aerial lights had no conventional symmetry, compared with the other configurations we recorded during our investigation. Another vital point of the investigation was to determine the air traffic that night, a real key to this entire incident. Therefore, after a couple of days of visits to different government agencies and phone calls, communicating directly with the Ministry of Defense in Madrid, the officer in charge of media relations told us that they "had detected no air traffic on the night of February 19 in the skies of Algeciras Bay." He also categorically denied that there were any kind of aerial maneuvers, either Spanish or foreign, that could have lead to confusion among citizens who observed the night flights. In short, "officially" the Defense Ministry had no answers to clarify what the UFO formations were that the dozens of witnesses described. For these particular incidents, we can assert that the strange lights were UFOs in formation (in the most literal sense) since neither the authorities nor the witnesses were able to identify the nature of these lights. But what were these formations of lights? Could they have been military aircraft, or secret prototypes? It is abundantly clear that these were not conventional aircraft practicing simple aerial maneuvers from Rota airbase. Keep in mind the high strangeness of some of the formations, both for their color and their maneuvers, seen by a highly qualified witness of night surveillance work, accustomed to identifying aircraft. Gibraltar operates a civilian and military airport but failed to clarify what kind of aircraft this was, eliminating the possibility that they were a normal military aircraft. 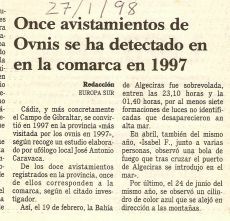 1 On the night of February 19, 1997, at Algeciras Bay were overflights, between 23:10hours and 1:40 hours of, at least, seven formations of lights that changed shapes. Halfway between the two sightings (Tarifa-Algeciras: San Garcia-Punta Carnero) lights were observed from a neighborhood far from Algeciras, named Pelayo. 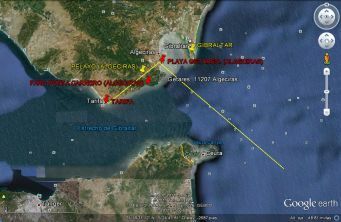 The distance traveled by the formation of lights, between Tarifa and Algeciras, was about 20 km, and the total distance traveled was about 80 km. 2 Five of these groups of observed lights were different. 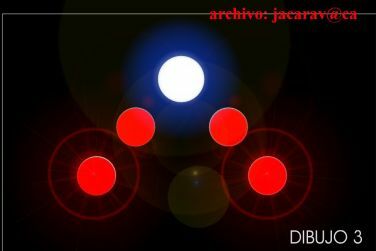 3a UFO formations were generally composed of several red lights (between five and eight), three or four times larger than a normal star. The witnesses, as seen in this study, also speak of white, green, blue and purple lights, with several formations intermittently present in the lights. 3b Nobody reported a dark mass around the exterior or inside the interior of the lights which would have been a great help in identifying the alleged "aircraft." The observation made with the aid of binoculars did not resolve this doubt, and the witness could not see any opaque body, although it should be noted that several fishermen indicated that one of the formations seemed solid, giving the appearance of being a single physical object. Therefore it is not unreasonable and can not be totally eliminated that some of the reported formations were a giant aircraft. 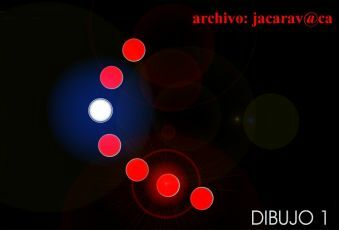 4a A white light was seen by several witnesses at the vertex of the formation consisting of a cluster of lights fixed geometrically but separated. This particular lighting excluded the possibility that the lights were from a conventional plane. 4b The red lights were composed, at least in one case, by two fixed, independent lights, one red and one blue. 5 The size of the formations were relatively large. 6 The formations had a steady course and speed. All formations moved at a very slow rate, as reported by all witnesses without exception. 7 Just a few witnesses heard sound. The noise was similar to that resulting from a plane with high tonnage. 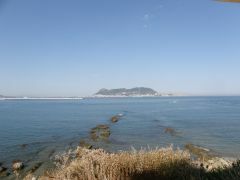 8 The course of almost all formations followed an imaginary line between Tarifa, San García (Algeciras) and a point at sea, between Gibraltar and the African continent. 9 The Ministry of Defence confirms the total absence of air traffic in the area that might cause such observations. 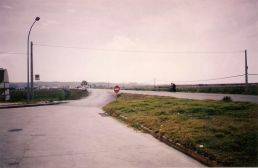 Alien craft, secret prototypes, nocturnal maneuvers -- none can be ruled out when trying to shed light on one of the most striking UFO events that have occurred in Spain, and that to this day remains an unsolved. Interestingly a very short time after these mysterious events, on March 13, 1997, in Phoenix, Arizona, a famous and controversial UFO sighting occurred….